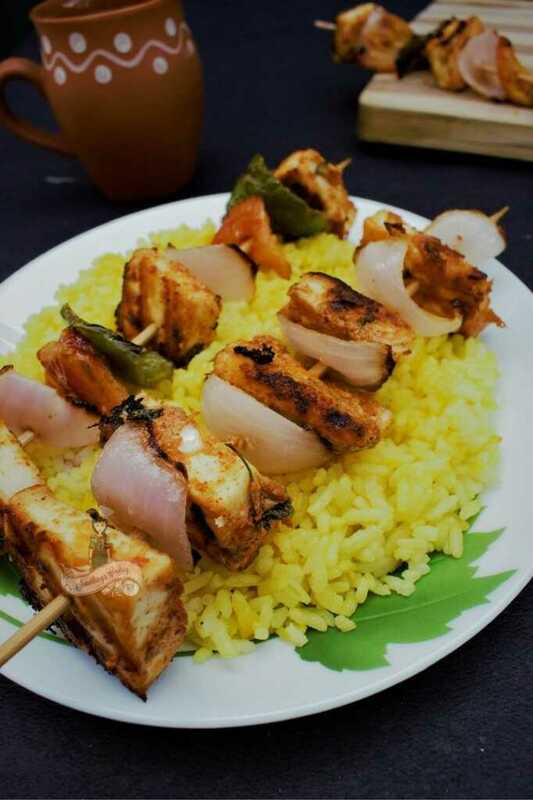 Chunks of Paneer cubes marinated in yogurt and spices are grilled in a tandoor, grill pan or oven to make these delicious Tandoori Paneer Tikka! Paneer Tikka is one of the many popular Indian appetizers. I wouldn’t be kidding when I say it is quick and easy to make and requires close to no oil. Furthermore, it can even be made in an oven. Unexpected guests at home? This is one dish which you can whip up easily. I love Paneer. Ask me to be vegetarian for a day, I would ask for Paneer. This happens especially during Navratri, for I always make it a point to take vrat during this festive season. It is the single most important thing that I have done since childhood. In South India, we aren’t particular about vrat food. That meaning, all we do is turn vegetarian for nine days. Omitting onion and garlic isn’t mandatory. There may be exceptions though. The only time I fasted for nine days having only water was the year I got married. I don’t know what made me do that though. Phew! c. Grill for the best restaurant style Paneer Tikkas! It isn’t rocket science and the spices used are available in an everyday Indian kitchen! A vegetarian alternative to Tandoori Chicken, this is one dish that you would love to have over and over again. The marinade is made of yogurt or hung curd along with spices including Kashmiri chili powder, coriander powder, cumin powder, garam masala powder black pepper powder, ginger and garlic paste, and dried fenugreek leaves or Kasturi methi. You can also add chaat masala and/or dry mango powder aka Aamchur powder. Mix together the ingredients under Marinade. Add paneer cubes and mix well. Keep aside. Alternatively, you can also refrigerator till use. 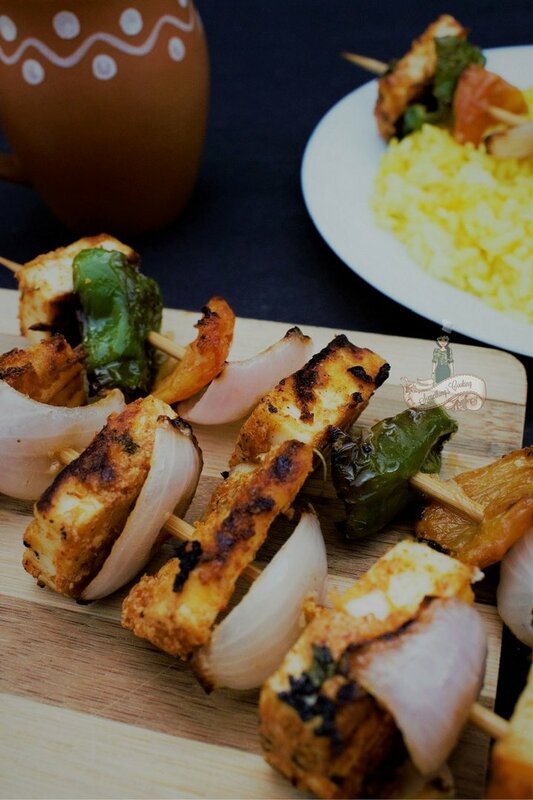 Skewer the marinated paneer cube alternating with onion, tomato and capsicum. This would make for three skewers. Heat a tablespoon oil of oil in a grill pan. 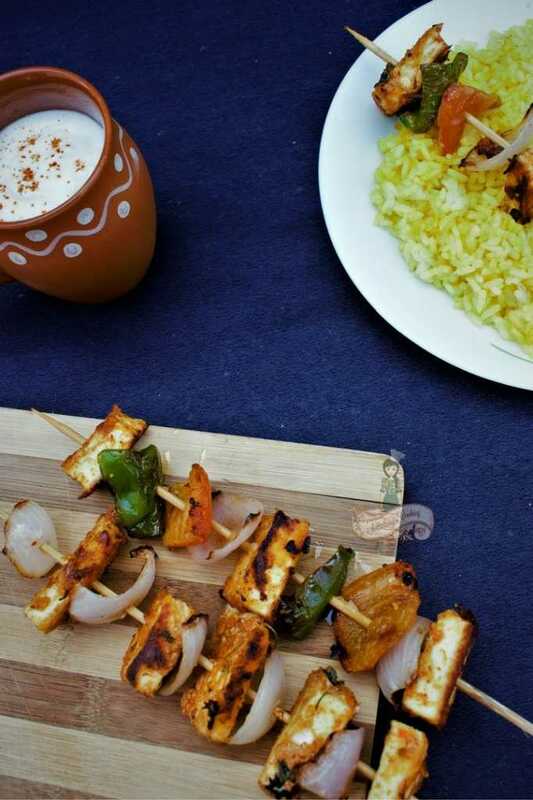 Place the skewers and cook till the paneer cubes have a slight char on its surface. Turn and cook the other side as well. Serve hot as an appetizer or on a bed of rice. Find other Paneer Dishes here. Like it? Pin this for later and try at home! 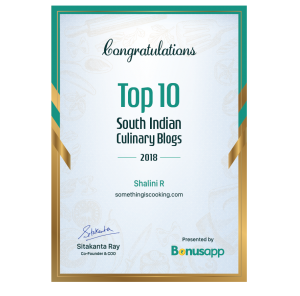 I am taking my Alexa Rank to the next level with Blogchatter. 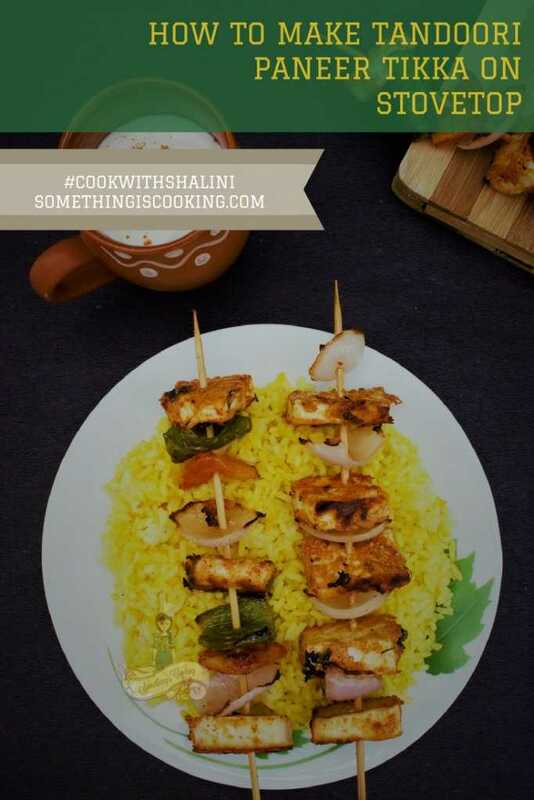 This birthday month, #CookWithShalini some yummilicious Party food. Previous Post: « Lamb Kebabs and a Biriyani too! Yummmmy! Just marinated following your recipe and chucked it all in the fridge for a bit. This is gonna be my dinner tonight…. will share pics tho am sure they will be nothing close to what you have shot here. This is one of my favourite dishes and goes perfectly with naan, parantha, rice; anything. And the pictures you’ve put up are absolutely mouth watering. Yum, yum, yum! Lip-smacking this sounds! Sounds quite easy too. Paneer is indeed a big deal for vegetarians and no party is complete without one or more paneer starrers! 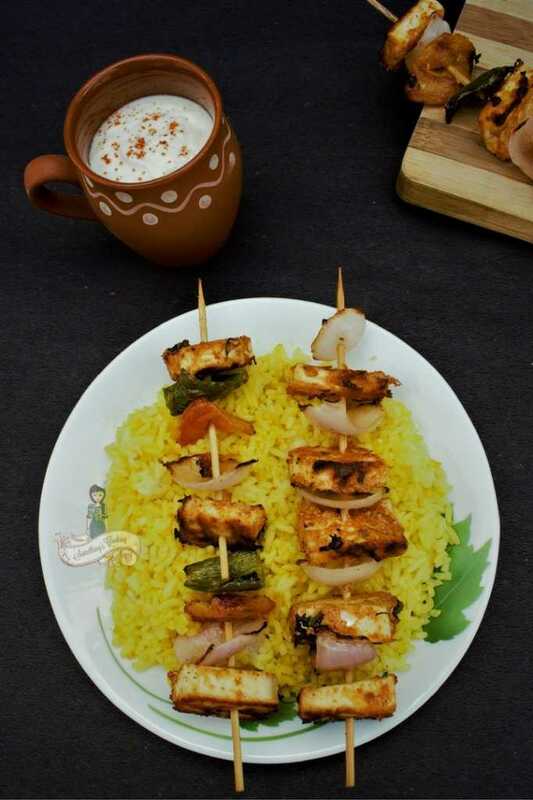 Awesomely tempting captures and some great plating too Shalini! What is tempt this is Shalini. I and my wife both love paneer. I prepare this many times at home. Its easy and yummy. A great choice for evening snack too. It is an all time favourite and made frequently at my home as hubby dear is vegetarian. Loved the photos . You are getting better and better with each post .